You must sign into your myHangout account in order to contact vibratingstring. vibratingstring has 19 friends. View entire friends list. Started with piano in grade school....Guitar beginning at 13, through the rock music age, then in about 2000, started the 5 string banjo (clawhammer style of play). Which of course brings me to the fiddle. Seems so easy when you see someone play it well. Needless to say, I learned a thing or two about that. I am a struggling fiddle novice. My sight reading skills are getting better, the more I play. Many and assorted bands. Love many kinds of music....jazz, rock, but lately it is mostly the love most old time country music that drives me forward musically. 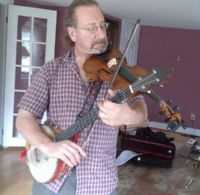 Lately, been playing lots of fiddle music from the Brittish Isles while I learn fiddle.